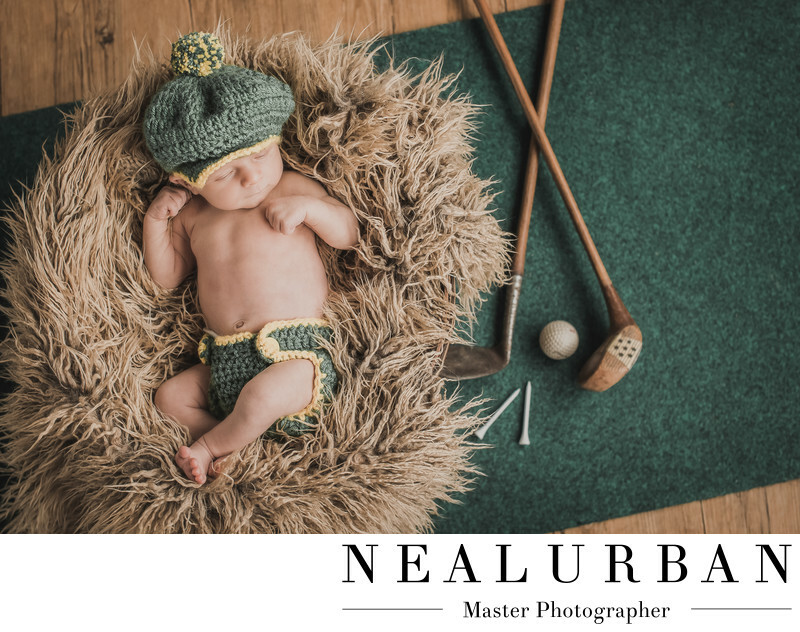 We loved this golf themed newborn session for Lauren and Nick Salvatore. They are members at Park Country Club and Nick loves to golf. We went there for their wedding photos. We thought a golf theme would be a great idea for the newborn session! Lauren sent me a picture of this outfit. Once we saw this, we could not wait. Look at his little hat! Neal has a putting green in the studio. He also loves to golf. We had some old golf clubs from antique stores we wanted to use. We put the baby in a low basket and lined it with this sandy colored throw. It sort of looked like a bunker. Neal took this from overhead standing on a ladder. We do this a lot for newborn portraits. We can create some really fun images shooting this way. This was just the beginning of baby Henry's photo shoot! Nick is the son of the owner of Salvatore's Italian Gardens in Buffalo. Nick and Lauren came in with wooden wine boxes and hundreds of wine corks. We only expected the golf set, but where in heaven with the wine things. They know we love wine too! We also had some glass carboys in our studio. We have those filled with wine corks! We ended up bringing those in as well. This newborn session was amazing! We had so much fun and created some beautiful images. I am already planning his first birthday cake smash photos! Lauren and I are definitely on the same page with ideas! Location: 2495 Main St. Buffalo NY 14214 United States.